Observations from the field this spring indicate much better winter survival of turf in southern Ontario as compared to the devastation of spring, 2014. There are some reports of damage in north, central and eastern regions of province. Many golf courses are open or opening soon across the south although the short range forecast is more winter-like than spring. It happens every year in the spring – sometimes earlier, sometimes later. Snow melts, or comes and goes as it seems to be this spring, and everyone is anxious to get out the house and on the turf… your turf. Pro shop phones are ringing with calls from golfers anxious to play. Sports field user groups are calling to ask when they can start scheduling practices or often just heading out and playing on the first sunny day of spring. Due to the demand for early spring access, some turf must die. 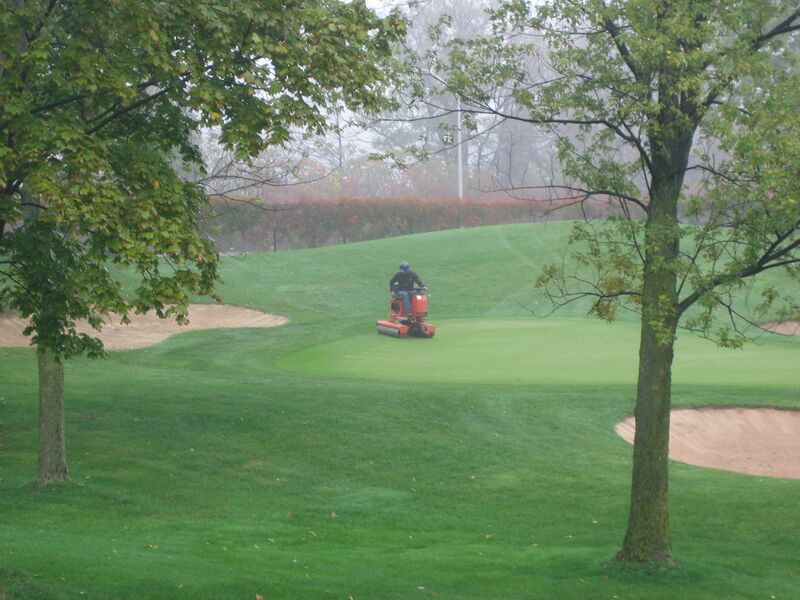 Most private club members have a long-standing culture of respecting the course and its turf. Often accommodations are made to provide some form of play on the range or practice areas during early spring like days which relieves some of the early course opening pressure. Public courses are in the business of making money and financial pressures trump agronomic concerns. Early spring play brings a dormant cash flow to life and can make or break a season. But what to do about protecting the turf that may be frosty most mornings, mostly dormant, often saturated and susceptible to death and destruction from enthusiastic early season play. Communication is more critical than cultivation at this time of year. It is a great opportunity to raise your profile and influence around the clubhouse. Tension between the pro shop and maintenance staff is an issue at many courses. Spring is an opportunity to reconnect with returning or new clubhouse staff. Share with them what is happening out on the course, identify areas of concern and give them the information they need to effectively communicate with members and daily fee players. While you may not be the most popular person around the clubhouse during morning frost delays, introduce yourself and welcome golfers to your course while at the same time explaining why they shouldn’t be out on frosty turf. There is an ever-growing community of transient golfers who may visit only when your course is the green fee deal of the day on GolfNow or other online green fee discounting site. These players may not always have the respect for the course of your regular clientele. Cart path only may become cart path only in view of the clubhouse. A combination of effective communication and on-course policing may be needed to protect your turf from damage. Starters and course marshals/player assistants are an often overlooked communication conduit for superintendents. Typically volunteers paid in golf, they are the staff interacting most frequently and personally with your golfing clients. Consider hosting an early season barbeque for them at your maintenance facility where they can get to know you and your staff and learn more about the challenges of maintaining a playable golf course. Take them for a ride along pointing out the damage caused by carts, areas sensitive to traffic and maybe even provide a lesson in ball mark repair. Handing out a few found Pro V1’s on occasion through the season will help to maintain your connection and their appreciation of the challenges you face and how they can help. On many public courses the pins are in and golfers are out before the grass has started growing or the ice is off the ponds. Restricting access to school or municipal sports fields is really only possible where fields can be fenced and locked. Even then, young athletes will often view climbing the fence as a good pre-game warm up. While most of us are advocates of natural turf surfaces, early spring is certainly a time when synthetic fields can take some pressure off frozen or saturated natural turf fields. If no or limited synthetic fields are available, consider directing them to temporary practice areas that may not usually be used as sports fields. Many European cities have off-season practice fields made of compacted stone dust that are low maintenance and usable in almost any weather condition. They have the added benefit of discouraging aggressive tackling. As in the golf business, communication with your client group is essential. Attend sports group organizational meetings to communicate with coaches and league officials about field restrictions not only in spring but throughout the coming season. Take advantage of the opportunity to educate coaches about other issues such as moving repetitive drills around on the field to more evenly distribute wear. Be prepared to listen and respond to their concerns about field conditions. Whether you are a golf course superintendent or sports turf manager, proactive communication can help to alleviate some spring turf damage but not all. We should be thankful that others value the properties we maintain. Be prepared to redirect traffic and/or plan for early season repair work to get the turf back in shape for the main part of the season. Accept that in spite of your best efforts, sometimes, some turf must die. If you have any interesting information to share from your experiences so far this spring or a suggestion for a future ONTurf blog posting, please let me know by email (robwith@uoguelph.ca) or phone (519-824-4120 ext 56886). The snow is finally starting to disappear and although there are still lots of dirty white remnants in the Guelph area, images are showing up on social media of green grass in Ontario. Warmer weather and rain forecast for later this week might remove most of the remaining snow in southern regions of Ontario. Some Ontario golf courses are opening this week and we are seeing the usual slew of home lawn care products and equipment showing up in stores and sales flyers. In this post, let’s take a quick look at spring start up activities. Most lawn care businesses have been active since last fall with sales and marketing campaigns to connect with existing customers and capture new clients. In terms of turf management practices, early spring activity can have a significant impact on the health of the lawn over the entire season. After sweeping off the driveway and patio, homeowners typically head out on the lawn as soon as the snow melts and the sun comes out. Cleaning up debris including any leaves missed last fall will insure the grass plants can grow unimpeded as soil and air temperatures rise. A brisk rake will also remove any matting and aid recovery from snow mold damage that is often visible on home lawns as snow melts, but rarely causes serious damage. Care must be taken not to get out on the lawn too early in the spring as foot or equipment traffic can cause soil compaction especially on finer textured soils. If you walk on the lawn and then track wet footprints across the driveway or patio, it is probably too wet to work on. 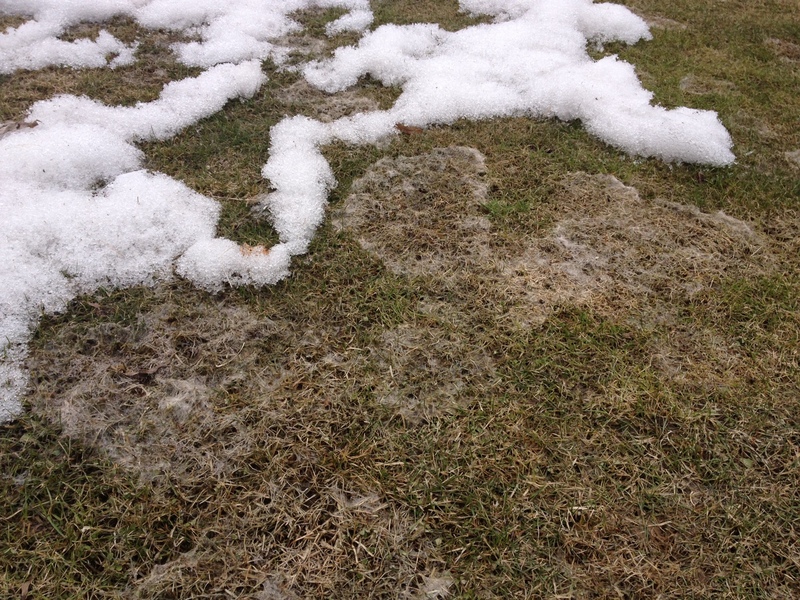 Snow mold appearance on lawn. Lawn rolling can be a significant source of early spring income for lawn care operators. While lawn rolling can help smooth small irregularities in a lawn surface, it will not correct major bumps or frost heaving which are best remedied through top dressing. Care must also be taken when rolling to avoid compaction especially on properties with fine textured soils or poor drainage. The general recommendations are to use a one ton or less non-vibratory roller and roll when soils are relatively dry. Although lawn fertilizers are featured in early spring sales flyers, application of fertilizer to lawns at this time is not recommended. Until soil temperatures warm up, nutrient uptake is limited and applied nutrients can be lost to spring runoff and rains. It is best to allow the lawn to begin growth in a more controlled manner and hold off until late spring before fertilizing. Many of the spring practices and precautions that apply to home lawns also apply to sports fields. One of the greatest challenges for sports field managers is managing early spring play. An early spring warm spell may bring out user groups prematurely to fields that are still very saturated. Play at this time of year can cause problems that will haunt field managers and users for the entire season. As most fields are not secured, it is virtually impossible to prevent all early season play but effective user group communication and field signage can help keep it to a minimum. Social media can be your friend in getting the word out as the season progresses. Also be sure not to create your own problems by sending equipment out on fields too early in the season. Careful observation of your fields as the spring progresses can help you identify drainage issues that may merit investment in surface or sub-surface drainage that can help alleviate future problems. Make note of the fields that drain quickly as well as those that are slow to dry out. This information will help you make future decisions about field opening as well as identify fields to monitor carefully during periods of heavy rainfall later in the season. Most golf courses are already engaged in the process of preparing for the season, whether it is simply starting to organize materials in the shop or if the snow is going or gone, cleaning up debris and moving course fixtures out in to their place on the course. Again, avoid equipment movement across turf areas until the ground is dry enough to avoid compaction. Spring rolling will help alleviate any minor frost heaving issues particularly on greens. Some golf courses in the extreme southwestern region of the province are already mowing greens and welcoming the enthusiastic spring golfers. With the Masters tournament broadcasting in all its green, azalea accented glory next week, golfers across the province will be anxious to start swinging. Ideally, course opening should be at the discretion of the superintendent and delayed until frost is out of the ground, greens are dry and firm enough that there is no tracking from equipment or foot traffic and when traffic on other areas of the course is unlikely to cause damage. Easy to say but hard to put in practice when the pro shop phone is ringing and members/owners are clamoring for the season to begin. 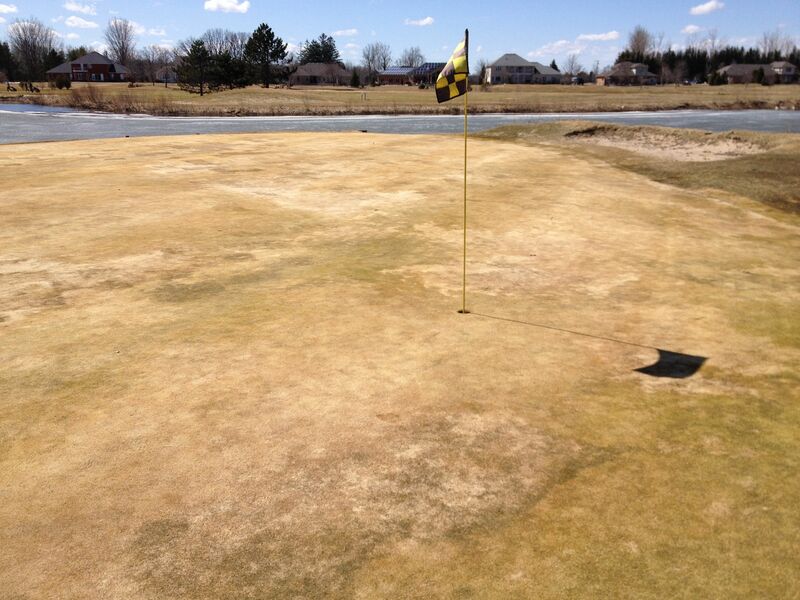 Providing temporary greens and/or practice areas can reduce the pressure to play. A spring opening article in an older trade publication suggests that you consider playing your course backwards from a temporary teeing area near the green to a pin cut in a tee. Not all courses would allow this set up but an interesting idea that might buy a little extra time for your greens. Ultimately communicating the potential damage and longer term cost of too-early play is your best answer to the “when are we opening?” question. There have been limited reports of winter damage but if you do have some localized damage, there are reams of information on turf repair after the devastating spring of 2014 – see last spring’s Fifty Shades of Brown posting for more detailed information. Do you have any spring start up tips or is there anything interesting happening in your corner of the turfgrass world? Click on the the “Leave a Comment” link below and let us know.